Welcome to a superb collection of FILM NOIR MOVIES offered from The Stellar Film Associates Collection. Film noir is a cinematic term used primarily to describe stylish Hollywood crime dramas, particularly those that emphasize cynical attitudes and sexual motivations. Hollywood's classic film noir period is generally regarded as stretching from the early 1940s to the late 1950s. Film noir of this era is associated with a low-key black-and-white visual style that has roots in German Expressionist cinematography. Many of the prototypical stories and much of the attitude of classic noir derive from the hardboiled school of crime fiction that emerged in the United States during the Depression. 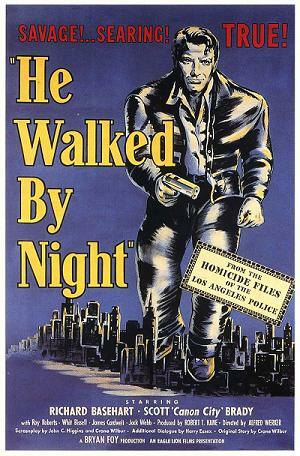 The term film noir (French for "black film"), first applied to Hollywood movies by French critic Nino Frank in 1946, was unknown to most American film industry professionals of the classic era. Cinema historians and critics defined the noir canon in retrospect; before the notion was widely adopted in the 1970s, many of the classic film noirs were referred to as melodramas. The question of whether film noir qualifies as a distinct genre is a matter of ongoing debate among scholars. Like ART, some of us might not be able to describe the art form, but we know what we like. When it comes to the Film Noir films listed below, we know what we like. It's ALL OF THEM. Edmond O'Brien, Frank Lovejoy, William Talman. Ida Lupino's The Hitch-Hiker is considered the first film noir directed by a woman. The film is based on the true story of Billy Cook, a psychopathic murderer and escaped convict who is picked up by two buddies on a road trip to Mexico. Cook plans on killing the two, but is eventually captured by Mexican police before he can do so. In 1998, The Hitch-Hiker was selected for preservation in the United States National Film Registry as being "culturally, historically or aesthetically significant." 1953 B&W 71 minutes. Paul Henried, Joan Bennett. John Muller, a medical school dropout and crook, has just been released from prison. He carries out a robbery at an illegal gambling casino. The gangster who runs the casino has a reputation for tracking down and killing his enemies. When the robbery goes bad, Muller is forced to run and hide. Soon he discovers that he's an exact look-a-like of a psychologist named Dr. Bartok. The only difference is that the doctor has a prominent scar on the side of his face. He kills the doctor in order to take over his life, but his plan backfires when he discovers that Bartok was broke and owed money to the mob. 1948 B&W 83 minutes. Robert Young, Betsy Drake, John Sutton, Florence Bates. The plot centers around Jeff Cohalan, a successful architect tormented by the death of his fiancÃ©e in a mysterious car accident the night before their wedding. He also notices that ever since the accident, he seems to be followed by bad luck. His horse and dog turn up dead without explanation and he wonders if he is cursed. Later, after more bad luck, he meets another woman. When she learns of his past, she starts to question her own safety. 1950 B&W 91 minutes.